Long-chain polyunsaturated fatty acids (LCPUFAs) have important roles in physiological homeostasis. Numerous studies have provided extensive information about the roles of n-3 LCPUFA, such as docosahexaenoic acid and eicosapentaenoic acid. Arachidonic acid (ARA) is one of the major n-6 LCPUFAs and its biological aspects have been well studied. However, nutritional information for ARA is limited, especially in adult humans. This review presents a framework of dietary ARA intake and the effects of ARA supplementation on LCPUFA metabolism in adult humans, and the nutritional significance of ARA and LCPUFA is discussed. Long-chain polyunsaturated fatty acids (LCPUFAs) are the main constituents of biomembranes and have important roles in physiological homeostasis. LCPUFAs consist of two individual series, namely, n-6 and n-3 series. 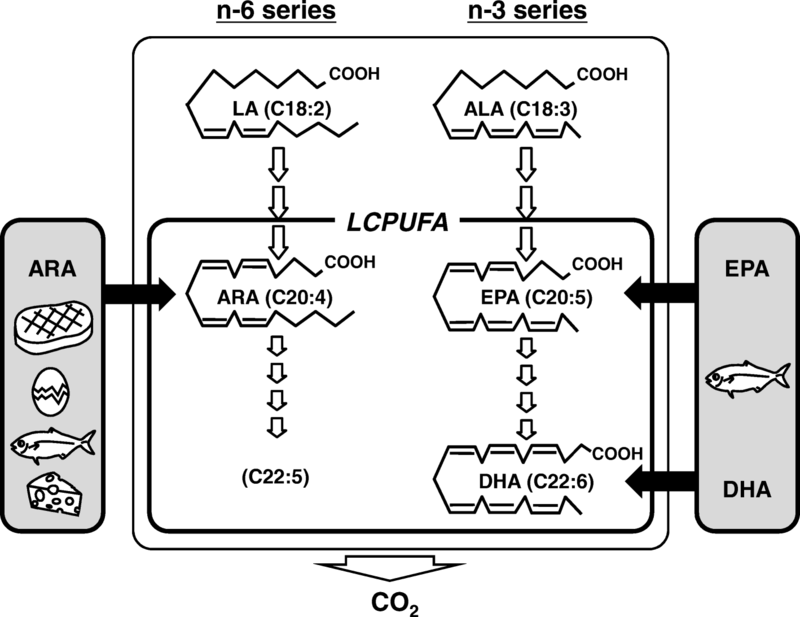 Humans cannot synthesize n-6 and n-3 PUFAs de novo, and convert linoleic acid (LA) and alpha-linolenic acid (ALA) obtained from foods to n-6 and n-3 LCPUFAs, respectively. LCPUFAs in the body are consequently derived from both the conversion of LA or ALA and the direct intake of respective LCPUFAs (Fig. 1). The major n-6 LCPUFA is arachidonic acid (ARA), and the major n-3 LCPUFAs are docosahexaenoic acid (DHA) and eicosapentaenoic acid (EPA). The importance of dietary intake of DHA and EPA has been extensively studied [1, 2, 3], but there is limited information for n-6 LCPUFA. Studies of ARA have focused on biological aspects, and many lipid mediators from ARA have been discovered and contribute to its medical application [4, 5, 6, 7, 8, 9]. However, little attention has been paid to the dietary intake and clinical effects of ARA itself in adult humans , although the knowledge in infant nutrition has progressed exceptionally [11, 12]. Recently, the efficacy of ARA supplementation has been reported in the fields of cognitive attention and memory [13, 14, 15], mood states , coronary circulation  and cirrhosis [18, 19]; and further nutritional understanding of ARA intake is expected. The aim of this review is to provide an overview of the impact of ARA intake in adult humans. 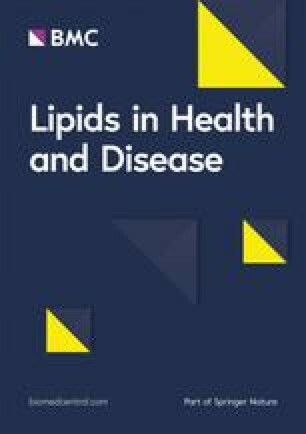 The author outlines the dietary intake of ARA from daily foods in adult humans of various countries, and reviews clinical trials of supplementation of ARA-containing lipids. ARA is found only in animal-derived foods because plants cannot synthesize C-20 LCPUFAs. The main food sources of ARA are meat, poultry, eggs, fish and dairy foods, as shown in Table 1 [20, 21]. ARA is contained in most animal foods [22, 23]; however, the contents of ARA are moderate, < 200 mg per 100 g of these foods, revealing the wide but small distribution of ARA in major animal foods. This is in stark contrast to the case of DHA/EPA. DHA/EPA is only found in seafood, however the content of DHA/EPA reaches from several hundred mg to more than 1 g per 100 g of fish. These data suggest that ARA intake may fluctuate less with the intake of certain animal food groups, in contrast to the case of DHA/EPA in fish. Table 2 shows the contribution of each food to ARA intake [24, 25, 26, 27, 28]. The proportion of meat and poultry is high (43–62%) in Europe [24, 25] and the United States , but is only 20–30% in Japan  and Korea . The contribution of eggs is high in Japan. Fish and seafood, the main sources of DHA/EPA, are also significant sources of ARA (4.9–12.2%) in all the countries. In elderly Japanese, the contribution of fish to ARA intake reached approximately 30% and was equal to that of meat . It is equivocal that foods of plant origin are described as contributors to ARA intake in some studies (potato, rice and pasta, 7.1% ; nuts. 9% ), as these plants cannot synthesize ARA or C-20 LCPUFAs. This suggests that the qualitative or quantitative accuracy of ARA content in food composition tables is not always complete, which may be one of the reasons why the calculation of ARA intake seems inaccurate in some cases, as described below. Dietary intakes of LCPUFA in 175 countries were estimated using food balance sheets from the Food and Agriculture Organization and food composition tables . The calculated ARA intakes ranged from 101 to 351 mg/day in advanced countries, and 44–331 mg/day in developing countries. This is a useful calculation derived from the statistical data of international agriculture and trade; however, it is only an estimation for individual countries and is not based on accurate amounts of LCPUFAs derived from direct measurements of food consumption of individuals or specific groups. The author therefore reviewed the studies to investigate the amount of dietary ARA using nutritional survey methods. Table 3 shows data compiled from surveys of more than 1000 healthy adults in a study and published from January 2001 [24, 25, 31, 32, 33, 34, 35, 36, 37, 38, 39, 40, 41]. The data were obtained from various areas, i.e., Europe, North America, Africa, Asia and Oceania. The amounts of dietary ARA intake range widely from 9 to 290 mg/day. The large differences may be attributable to the survey method or the dietary habits in individual countries. First, with respect to the survey methods, it is notable that similar amounts of ARA intake were reported in four studies [24, 32, 38, 40] using dietary record (DR) or 24-h diet recall (169–230 (male) and 117–160 (female) mg/day). Generally, the quantitative accuracy of DR or 24-h recall is thought to be superior to that of the food frequency questionnaire (FFQ). Most of the other studies using DR or 24-h recall with smaller numbers of participants also reported that ARA intakes were around 100 mg/day or more, although there are some exceptions (Table 4) [28, 42, 43, 44, 45, 46, 47, 48]. These studies suggest that ARA intake, at least in advanced countries, is 100–250 mg/day for normal healthy adults. This is a similar but narrower range compared to the calculation from the statistical data described above . ARA intake in the tens of mg per day reported in some surveys is similar to or less than that of American vegetarians (3–44 mg/day) , and seems too low. Similar results were reported in the other studies with limited numbers of participants in Germany , Norway , Canada [51, 52] and Japan [27, 29, 53, 54]. Studies reporting that ARA intake is several mg/day are likely to contain errors in their calculation methods. To accurately assess the amount of ARA intake, it may be important to reexamine and revise the ARA content reported in various food composition tables. Second, with respect to dietary habits in individual countries, it is expected that ARA intake is associated with the amount of animal food intake. This is strongly suggested by the study of vegetarians, where the strictness of animal food avoidance is proportional to the decrease in ARA intake . Although a similar situation may be infrequent in advanced countries, it may occur in developing countries. ARA intake was reported to be 33–34  or 39 mg/day  in rural areas of South Africa, which is approximately one-third of that in respective urban areas. In any case, it is expected that additional high-quality nutritional data of dietary ARA intake in various countries and groups will accumulate. Numerous studies for infant nutrition have clarified that DHA and ARA are present in breast milk, that infants themselves have only a weak ability to synthesize DHA and ARA endogenously from ALA and LA, and that addition of DHA and ARA to infant formula is preferred for development of infants [11, 12]. Fish oil is a good source for DHA, and has been used for an ingredient of infant formula. However, as described above, the contents of ARA are moderate in common foods. Since there was no practical source for ARA, a new ARA oil with high-quality was needed. In order to obtain oil with high ARA content for addition to infant formula, a microbial fermentation oil was developed in 1987 [55, 56]. The fungus Mortierella alpina accumulates large amounts of ARA-containing lipids in its cells , and an industrial production process for it has been established [58, 59]. This oil has been used for infant formula worldwide . At the same time, ARA oil is now used for adult humans, especially the elderly, making it possible to investigate the physiological roles and efficacy of ARA [61, 62, 63, 64, 65, 66, 67, 68]. Table 5 summarizes the clinical trials reporting changes in ARA composition of blood in adult humans with ARA supplementation [16, 17, 19, 69, 70, 71, 72, 73, 74]. The ARA-containing lipids of M. alpina were used for ARA supplementation in all nine studies. The conditions of the trials are different from each other. Doses of ARA as free ARA were 82.8–3600 mg/day with or without DHA/EPA. Supplementation periods were from 14 days to 3 months. Fatty acid analyses were conducted using plasma phospholipids (PL) or red blood cells (RBC). Interestingly, the smallest dose of ARA (82.8 mg/day for 3 weeks) resulted in a significant increase of ARA composition in plasma PL and RBC . The second smallest dose of ARA (120 mg/day for 4 weeks) with DHA/EPA (300/100 mg/kg) also increased ARA composition of plasma PL . These doses of ARA are equal to or less than the standard dietary ARA intake (100–250 mg/day), as reviewed above. These data support that dietary ARA intake from daily foods should contribute to the increase or maintenance of plasma ARA composition, which may have been understated so far. All the doses of ARA increased blood ARA levels regardless of co-supplementation with DHA/EPA. Correlation between the dose of ARA supplementation and the change of plasma ARA composition is shown in Fig. 2. The increase in plasma ARA composition is dose-dependent over a range of 82–3600 mg/kg (r = 0.87). 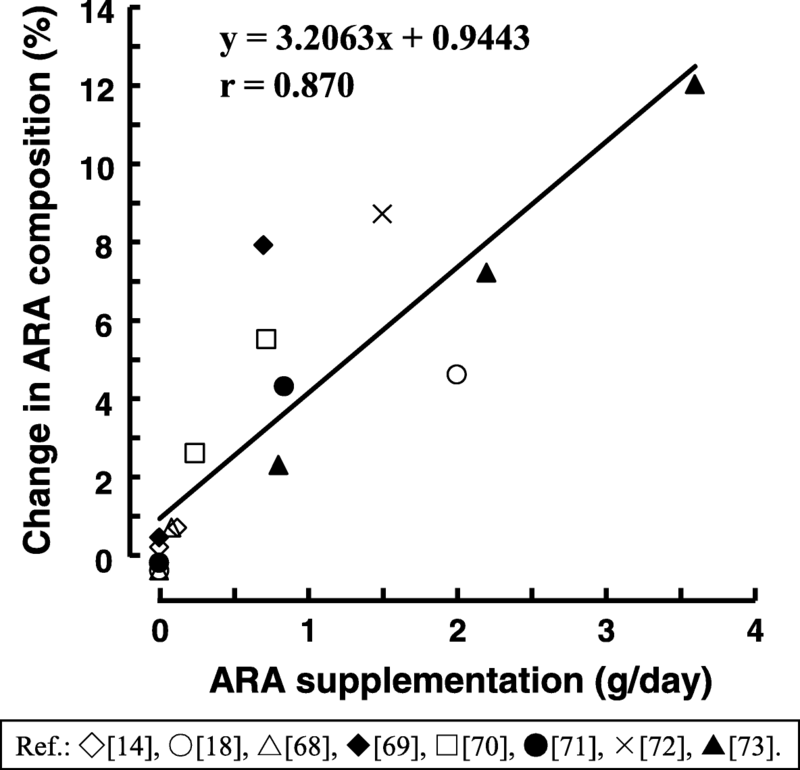 ARA supplementation does not result in decreased DHA/EPA composition as shown in Table 5. DHA/EPA composition was unchanged by 700 mg  or 838 mg  of ARA per day. In the same manner, 240 and 720 mg  or 1500 mg  of ARA per day did not change DHA/EPA composition. In contrast, it is well known that ARA composition is decreased by DHA/EPA supplementation [75, 76]. Interestingly, it is commonly observed that ARA supplementation results in large decreases in LA composition [71, 72, 73, 74]. It appears that the capacity for exchange or retention in the body is in the following order DHA/EPA > ARA > LA. The substrate specificities of various acyl transfer reactions are thought to be related to this phenomenon; however, the details are unclear. It is important to consider the mechanism of LCPUFA metabolism, which requires further clarification. This review of dietary surveys of ARA intake indicates that ARA is obtained from a wide variety of animal foods, such as meat, poultry, egg, fish and dairy foods, and that the amount of ARA intake is 100–250 mg/day in advanced counties. Meanwhile, ARA intake may be in the tens of mg/day in developing countries. The review also demonstrates that ARA supplementation (82 or 120 mg/day for 3–4 weeks) at a dose equal to or less than the dietary ARA intake increases plasma ARA composition; that plasma ARA composition is ARA dose-dependently increased in the range of 82–3600 mg/day; and that ARA supplementation decreases plasma LA composition, but not DHA/EPA composition. ARA intake from foods or supplementation is thought to have a great impact on LCPUFA metabolism. The continued accumulation of evidence from large and well-designed dietary surveys and clinical trials is expected to confirm this. The author is grateful to Institute for Health Care Science, Suntory Wellness Ltd., for scientific suggestion to carry out this work. HK is an employee of the Suntory Holdings Group. Canadian nutrient file version 2015, Health Canada, Government of Canada. 2015. https://food-nutrition.canada.ca/cnf-fce/index-eng.jsp. Accessed 29 Jan 2019. Standard tables of food composition in Japan 2015 (seventh revised edition), Ministry of Education, Culture, Sports, Science and Technology, Japan. 2015. http://www.mext.go.jp/a_menu/syokuhinseibun/1365451.htm. Accessed 29 Jan 2019.